This is an offshore trolling fishery. We use 30-pound mono, which I like to double up before tying on the leader. Unlike a lot of offshore fishing, we're only going to use about 10 pounds of drag on these fish. If you don't like tying a Bimini Twist to double your line, we have an easier option that works fine for this application. Start by pulling two arm lengths of line and doubling it. Make a loop in the double line a foot from where the tag end and standing end meet. Wrap the doubled line around the top of your loop five times. Pull the line on either end of the loop with the wraps and snug it tight. Closely trim the tag end. You can tie the double main line to the swivel using an improved Clinch Knot. Using 40-pound fluorocarbon for your leader, tie the leader to the swivel using this method: Pinch the standing end between your index finger and thumb and make three wraps around your index finger. Pull the three wraps off your index finger, push the tag end through the loops and pull tight. Run your leader through the lure skirt. Any bright colors for the lure skirt or feathers will do -- including blues, pinks, greens and oranges. Tie on a 6/0 VMC Permasteel hook using your terminal knot of choice. A Uni Knot or Snell will both work. I troll this rig with four rods off of a center console. We set two lines out long at 75 to 100 yards each, and two outside rods short at 40 to 75 yards. These fish are typically in 600 to 800 feet of water, but it can be as shallow as 150 feet. 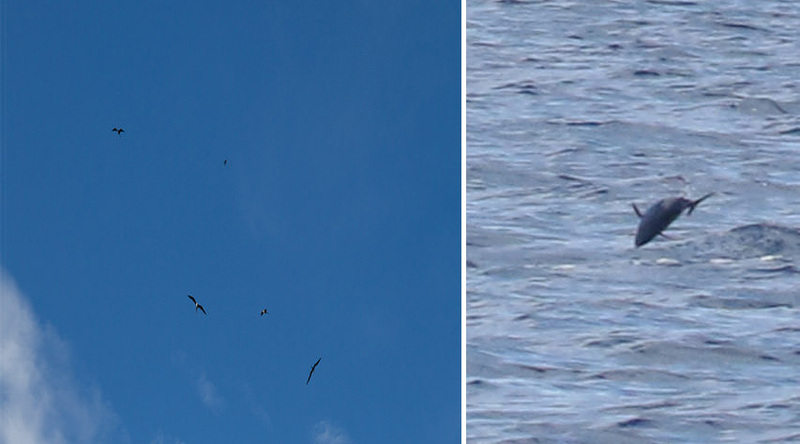 This is not a complex fishery, and your best bet is to look for birds (frigates up high or down low on the water) and keep an eye out for fish busting on the surface. 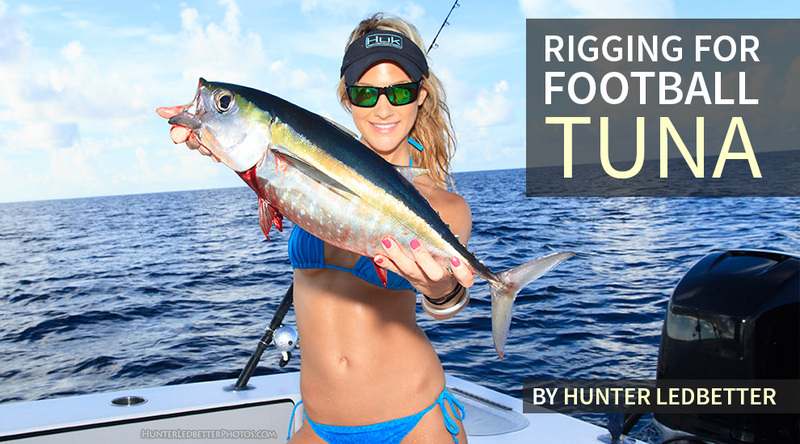 Once you find the tuna the action can get crazy, so make sure you're rigged up and have the fish box ready!